Keyword Research - What is the Rank column and how to choose the right keyword to target? This is a specific topic on keyword research which explains the role of the"Rank" column in VMB'. We are using the example of "Plumber New York" in this case. The values displayed under the "Rank" column is based on our internal algorithm which ranks the keywords and the highest represent the "best fit" keyword. In this case, if you want to choose the best potential keywords, you have to exercise the rank factor , the search results/YT competing videos and some basic common sense too. ..simply because they are long tail keywords (3 or more words), rank is not too high nor too low (something among the middle), and the search results/YT competing videos which represents competitiveness is reasonable. FYI if the search results/YT competing videos is very high which in this case more then 1,000,000 then it is bad choice as you will lose against those highly competitive videos. 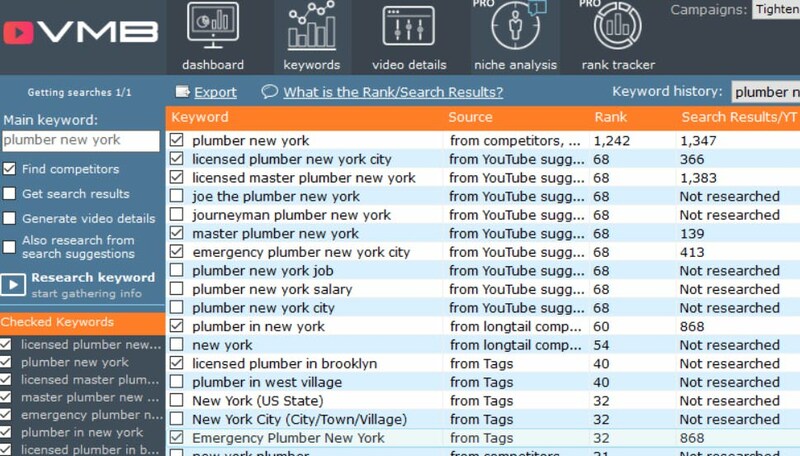 But there are other keywords where the "search results/YT competing videos" shows lower and more reasonable values 146 for "master plumber new york" etc. Clearly this shows this is a more viable choice to make. In summary - Use the data presented under "Rank" for relevancy guidance, "search results/YT competing videos" for competition guidance purposes. Lastly - exercise common sense to see the keyword itself is suitable to be used in your video title.